• 1 x 4 channel DVR and 2 x 1080P Weatherproof Cameras. The DVR connects to cameras through coaxial cables, and the recorder supports legacy analogue cameras in addition to 1080P cameras. 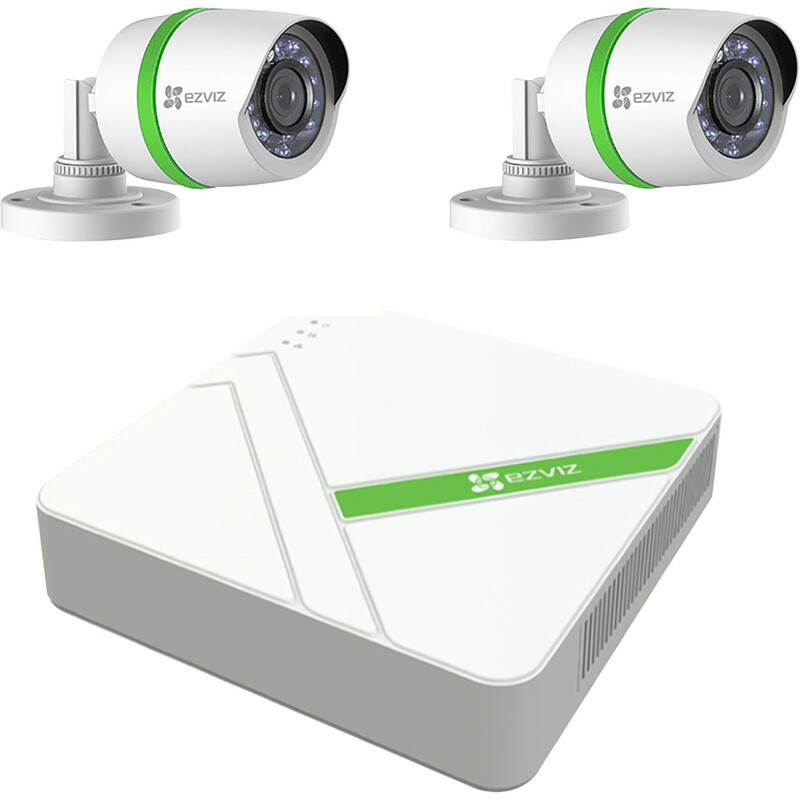 • View live video and control your security system 24/7 from a smartphone or tablet with the EZVIZ app. • Durable, weatherproof camera, withstanding harsh elements such as wind, rain and snow in temperatures ranging from -40 to 60 degrees Celsius. Ezviz 1080P DVR CCTV Kit BD-1422B1 is rated 3.5 out of 5 by 6. Rated 4 out of 5 by Cokecan from Lights camera action Very easy to set up quality seem very good clear picture day and night, smart viewing on mobile if download app, but overall value for money. Rated 5 out of 5 by Lumber_Jack1978 from Reasonable upgrade from old system Purchased this to upgrade an existing system as wanted something inexpensive. I used my old wiring so installing was easy and the set up straight forward. Image quality is great in the daytime and good at night; I re-positioned one of the cameras as there was some reflection from a wall in the foreground which made the image darker behind and this really improved the night time image. Remote viewing is nice on my iPhone and I have also bought one of the Ezviz Mini O camera to use inside which works through the same app. Rated 5 out of 5 by SandTJ from Simple and great features I found it easy to install myself without an installer but I would say to get an installer if you are unsure of wiring through walls etc! I am really pleased with the features and the ability to check on my home while I am away via the app. I picked this up in-store and staff were very helpful! Rated 1 out of 5 by ms_MBES from awful had two different products from EZVIZ but found numerous issues setting them up after the initial setup ie re configuring. The IOS app is not very nice to use and support is pretty poor. I had hoped this would be a nice basic camera that would do a straightforward job but wasted lots of time on it. Rated 1 out of 5 by fred1957 from Useless in the dark Easy setup but not fit for the purpose as you couldn't distinguish anything in low light which is exactly when you need it.